Wes is from Rock Hill, South Carolina. Melissa is from St. Louis. Their paths crossed a few weeks into their freshmen year at Clemson University. They stared dating in November of their freshmen year and the rest is history! After college, Wes went on to the University of Florida for a Master's in Wildlife Biology and Melissa went to South University for a Master's in Anesthesia. Wes proposed on Okaloosa Island in Florida in June 2014. 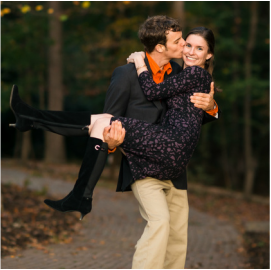 Since the proposal, both Melissa and Wes have finished their Master's degrees and Wes has started working on his PhD. Wes and Melissa are so excited to officially start their lives together. Wes and Melissa are looking forward to their honeymoon in Nicaragua.